I go through phases now and then with my likes and wants. It plays out in various ways from what I wear (heavy cotton t-shirt with pocket) or what I eat (banana smoothie with sun-butter, rice milk and oats) or how I spend money (vintage pie and cake servers). I kinda get myopic and somewhat obsessed for brief periods of time, then I move on and find something else to satisfy my attention. Lately I’ve been a little obsessed with bacon. This isn’t necessarily a major obsession but more like a fascination—one I’ve been exploring and photographing lately. Raw bacon. Cooked bacon. Basically any bacon…except for Kevin. I know I’m not the only one thinking about bacon. Ever see Bacon Dental Floss or Bacon Bandages? Click here and you will. 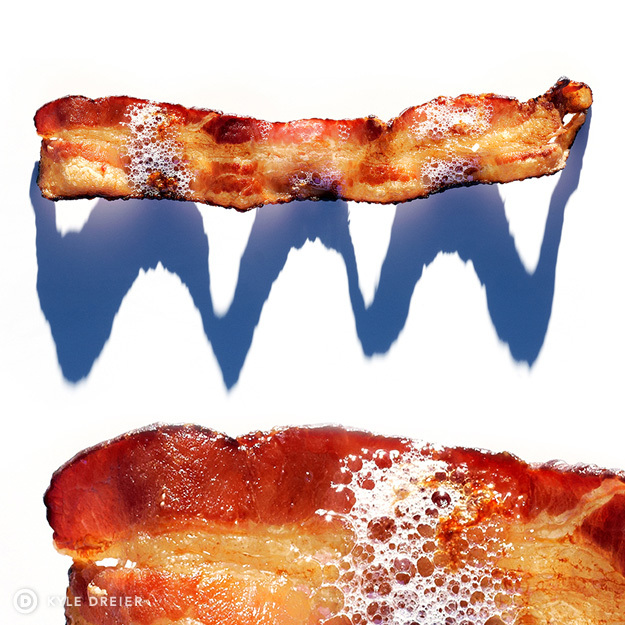 I’ll have more bacon thoughts and images to share later, but for now I thought you might like to contemplate one of my latest images.